Keyanna Sanders is about to get everything she could ever wish for on her 18th birthday: a hot guy who’s really into her, the sports car she’s always dreamed of owning, and the party of a lifetime that no one will forget any time soon. But before long, she’ll understand these wishes are more than a coincidence, and that they come at a steep price. Keyanna is more than just an average high school senior, her best friend is more than the innocent boy next door, and her sudden good fortune isn’t just by chance. When her estranged father suddenly re-enters her life, she’ll have to decide who to trust, and whether or not the man she loves has become the enemy. Pretty much, yes. I remember in 3rd grade writing a story about My Little Ponies and declaring I would grow up to be a writer. I stuck to my guns and wrote dozens of novels up until college, when I felt overwhelmed in declaring a major. Then I started a family and the writing thing got lost until recently when someone in my family had a major medical issue, and I realized life was too short not to go after what I love. So I was in my 30s before it finally became a reality. What drew you to the YA genre? Growing up in the 80s I was obsessed with John Hughes and Stephen Spielberg films, and wrote a ton of fan fiction based on their movies (I just realized a few years ago what I was doing was actually called “fan fiction”). I tried to write an “adult” book after high school, but was still mesmerized by the magical feeling of the teen movies I loved growing up. Preparing to go off on your own into adulthood is such an exciting time! I often think being an adult is boring, and miss the energy of being young, awaiting new challenges with bright eyes. Are there any books and stories that have influenced or stuck with you from your childhood or young-adulthood? I don’t think my parents were aware at the time, but I started reading Stephen King in 5th grade and was pretty much obsessed with his work by high school. I’ve always liked the idea of being scared, and using my imagination to explore what would happen if monsters were real. While I don’t feel I’ve actually dove into the horror genre quite yet, it’s still something I hope to do one day. I'm just not sure I could do it justice. Do you have any other works published and how do they compare genre/style wise with your current work? I’ve just completed my 8th book for publication. While all of my YA books deal with some sort of paranormal element, What I’ve Done and Shymers (a dystopian story) are both told by girls who are a bit more gentle, and naive to the world around them. Cheating Death is about a popular girl who makes bad decisions, and deals with some pretty dark subjects. 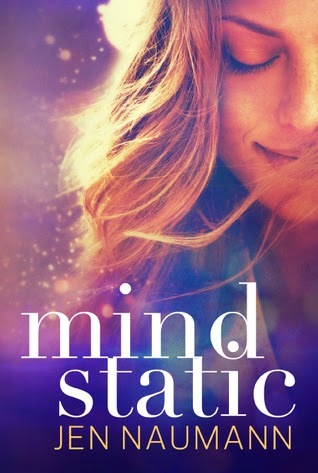 The heroine in Mind Static is confident with a little attitude, giving the story a fun and lighter feel. My favorite YA so far is Paranormal Keepers in which the girl is smart, good humored, and brave. My 8th book, Adam’s List, is my debut as a NA contemporary romance author (for readers 18+) under the pen name Jennifer Ann, and is set to release June 17th. Do you have any current writing projects? Can you tell us a bit about them? Although there are at least five other projects I’d rather be working on, I just started the sequel to my most popular book, Shymers. Since I left readers with a big cliffhanger, I’ve felt a tremendous amount of pressure with the second book and kept putting it off. I finally decided I owe it to my fans to finish Olive and Harrison’s story. As with my zombie series, it will most likely become nothing more than a two-part series, although I’ll never rule out more books in the future if I feel like adding to it. It’s just that my ADD won’t allow me to focus on one project for very long. I’m also hoping to get a sequel to my NA romance novel out by the end of the year. Jen Naumann grew up in southern Minnesota as an addict of such flicks as Indiana Jones and The Goonies until she discovered John Hughes, and spent her high school days locked away writing love stories with a sci-fi twist. Married to a farmer in southern Minnesota, she tries to follow the madness of her four active children while balancing an imagination that never shuts down. As the author of CHEATING DEATH, SHYMERS, AND PARANORMAL KEEPERS, she writes stories with strong female leads who have a good sense of humor and tend to fall in love despite their better judgment.